Not all in one place, anyway. “Cream pie” comes from page 20, “deeply,” from page 41, and “sexual,” page 37. But the book isn’t titled “Indoctrination U: The Left’s War Against Academic Freedom” for nothing. 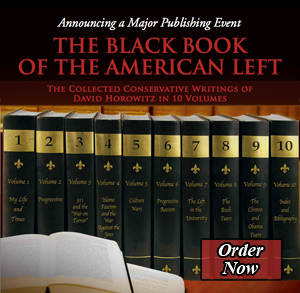 And if the standards set by the nation’s intellectual elite might be stretched outside the classroom — and their guiding principle of “no higher principle, except for that which furthers personal political bias and politically charged correctness” might be applied in these outer arenas — then most certainly, to some, David Horowitz believes in the aphrodisiac powers of cream pie. Laughable as it would seem, this outright fabrication very nearly reflects the true day-to-day affairs in America’s supposed hallowed halls of higher learning, according to Horowitz’s findings, which come as a sort of follow-up to his previous book, “The Professors: The 101 Most Dangerous Academics in America” (Regnery, a Human Events sister company.) But while “The Professors” focused on people and on holding those individuals responsible for the decay of American education, “Indoctrination U” points to the failing system as a whole — the insidious usurpation of college administration, policy, and course and class offerings by sundry Marxists, Socialists and anti-Americans who seek nothing less than to brainwash students with the politically favored causes of the day. Horowitz’s reaction to these ill-disguised brain-washings was to create and promote an Academic Bill of Rights for students, making clear the mission of a university is to provide an atmosphere for “the pursuit of truth, the discovery of new knowledge … the teaching and general development of students,” and so forth. And because higher learning has failed so thoroughly in these regards, Horowitz also took steps to promote a similar document for grades K-12, the breeding ground for the university-level abuses. This latest book details Horowitz’s success in bringing these documents to formal adoption by America’s schools and universities. But, for example, here’s how the battle’s being waged, as illuminated by the sarcastic reception of a union leader who caught wind of the document as it wound through the State University of New York system for administrative review and consideration. It’s an “Academic Bull of Rights,” he quipped. Should Conservadom, in the spirit of positive reinforcement, ever decide to create awards for its most valuable commentators, it is quite likely that David Horowitz will be summoned to the podium each and every year until the time of his death. Few other figures have so resolutely, and creatively, battled the left over the course of the past two decades. His ingenuity, zeal and sense of humor are apparent in the titles of his works, such as How to Beat the Democrats and Other Subversive Ideas, The Art of Political War and Other Radical Pursuits, and Hating Whitey and Other Progressive Causes. His careful and inflammatory choice of wording is again discernible in his latest release, Indoctrination U: The Left’s War Against Academic Freedom. The book is essentially a postscript to last year’s The Professors: The 101 Most Dangerous Academics in America as it provides an antidote to the toxins disseminated by the 101 pseudo-scholars detailed within. The cure Horowitz offers to the propagandizing of the bottom10 percent of the professorate is called The Academic Bill of Rights. The context and story behind Indoctrination U is the author’s attempt to gain publicity for the proposition. Having it enacted by state legislatures was never his primary goal. What he sincerely desired was for universities to preemptively adopt its essence into their own bylaws. The Bill itself is reproduced in an appendix. Its language is well-crafted and rather innocuous, yet one would never know this from the reaction it received from its critics. They dubbed it “crazy, Orwellian, a witch hunt,” and totalitarian in nature. Their disparagement is perhaps a ruse to better enable them to protect their own privilege as tenets like, “No faculty shall be hired or fired or denied promotion or tenure on the basis of their political or religious beliefs” is not the stuff of McCarthyism. Although, should it be rigidly interpreted, a clause like, “Faculty will not use their courses for the purpose of political, ideological, religious or anti-religious indoctrination” would completely threaten the activists’ way of life. Commandments like that are far more threatening than having their beloved Fairness Doctrine applied to network news broadcasts or NPR. The story within this story is the way in which his enemies eschew discussion of the document in favor of excoriating Horowitz. They had several opportunities to do so as he posed for them repeatedly atop a podium during his college speaking tour. Wherever he went, he was alchemized into a resolution for debate. A trip to one California state school saw him become the first conservative invited there in its 11 year history while at Butler he got hit in the face with a pie [stunning argumentation]. Even more absurd was the warning an administrator gave just before he commenced his speech at the University of Chicago. She noted that a safe room was available should the speaker’s words prove too harrowing for youthful ears to tolerate. His presentation at Reed College was unexpectedly rebutted by the Dean who had little to say about the Academic Bill of Rights but denounced Horowitz as a “political pornographer.” The dean’s spiel was actually encouraging because pressure from his superior brought about an apology. Horowitz was met by protestors at Penn State even though the university’s Policy Manual contains the same type of restrictions on instructor behavior which are outlined in the Bill. Those who actually discussed the initiative were generally dismissive. One proclaimed it a “solution in search of a problem.” How much better off the country would be if such a view was correct. The liberal arts programs within our universities have become leftist bastions whose purpose is no longer to pursue truth. Unlike with the sciences, whose colleges are the finest in the world, numerous liberal arts departments have become completely politicized and are little more than ad hoc centers of agitprop. Many of our tenured luminaries even question whether there is such a thing as truth or objectivity at all. Their skepticism makes for all kinds of classroom mischief as they idolatrously worship the troika of race, class, and gender. What “social justice” should mean is that the citizenry has the right to keep what they’ve earned, but, in the mouths of radicals, it is morphed into a description of government’s attempt to pit one social group against another via an arbitrary, and authoritarian, redistribution of wealth scheme. Political correctness functions as the academy’s Cerberus. It tyrannizes the marketplace of ideas and uses wonderland logic to turn its critics into peddlers of hate speech. Some have argued that the professorate’s overwhelmingly leftist slant fails to prove that any discrimination in hiring transpired—even though they would never repeat these same words regarding the proportion of minorities within a particular business or profession. Theoretically, this is true but there is no shortage of evidence documenting the penchant anti-liberal utopians have for barring the impure from their ranks. None of this really matters though as the Bill has no provision for the hiring of conservatives. What’s done is done. The hope for people like Horowitz is that public awareness of past wrongs will allow for the future to be salvaged. In the final analysis, what good has come from the imbroglio over The Academic Bill of Rights? Well, there have been some mild successes. Princeton University passed a “Student Bill of Rights” while Temple University enacted a policy to prevent students from being politically bullied in the classroom. According to Horowitz, over 20 projects similar to Penn State’s Center for the Study of Free Institutions and Civic Education have been created as a means to instill intellectual diversity into our universities. Of course, for the foreseeable future, the only accolades academe will win for tolerance are ones it bestows upon itself. Length, or a lack thereof, is the lone reservation this reviewer has about Indoctrination U. Another four or five chapters would have been mightily appreciated. Horowitz admits that there were many attacks and accusations that he chose not to document, but we would be better off if he had. Not only do these “teachable moments” provide proof of perpetual injustice, they also make for serious entertainment. Seinfeld would have difficulty dreaming up material as goofy as the “safe room” comment in Chicago.